Naturalized in California. Present in 2 counties according to Calflora. Also naturalized in Australia. Naturalized in California. Present in 2 counties according to Calflora. Also naturalized in Australia in areas which match California's climate. Considered invasive in Australia, details included in an Invasiveness Assessment and Impact Assessment prepared by the Victoria State Government. Considered invasive in Australia, details included in an Invasiveness Assessment and Impact Assessment prepared by the Victoria State Government. Is present in New South Wales in areas with climates which match California. Onopordum acanthium is also considered invasive in Australia in areas which match California's climate. O. illyricum points in GBIF for its native distribution in southern Europe as well as some of the points for Australia match California's climate. Stems can persist into the next season with spiny phyllaries and receptacles attached. In dense patches, this dry matter may introduce a minor change to the frequency of fire risk. O. illyricum impacts grazing systems because it is spiny. Illyrian thistle tends not to be grazed by stock because of its dense spines. However, if the weed is grazed, the spines can cause damage, particularly around the mouths and eyes of animals. “Dense patches pose a physical barrier to humans.” The spiny nature of the plant is an annoyance to humans. Illyrian thistle's only method of dispersal is by seed which is equipped with a pappus of fine hairs and is spread by both wind and water. Rees, M.., Sheppard A.., Briese D.., & Mangel M.. (1999). Evolution of size-dependent flowering in Onopordum illyricum: A quantitative assessment of the role of stochastic selection pressures. American Naturalist. 154, 628–651. Illyrian thistle seeds have an initial short-term innate dormancy, following which the majority of seeds acquire induced dormancy, rendering them incapable of immediate germination. Some O. illyricum plants flower in the first year, others in the second year. 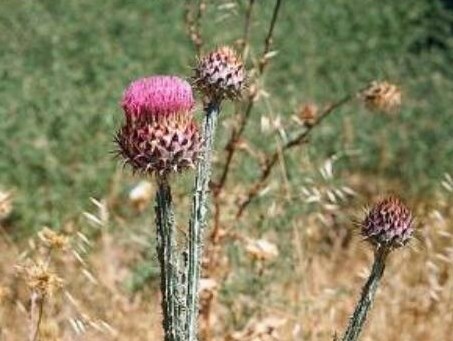 In Austraila, Illyrian thistle flowers for three months and produces seed for 3 months. The pappus of the seed attaches to wool, vehicles, clothing, etc. or it can be a contaminant in hay. The pappus of the seed attaches to wool, vehicles, clothing, etc or it can be a contaminant in hay.